H.I.H. 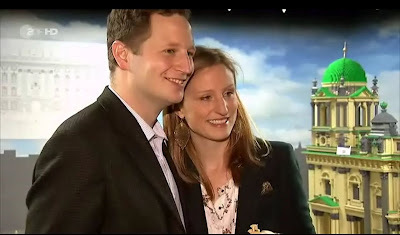 Princess Sophie of Prussia gave birth to twins on Sunday, 20th January 2013. The wife of H.I.H. Prince Georg Friedrich, head of the German Imperial and Prussian Royal Family, delivered Prince Carl Friedrich and Prince Louis Ferdinand prematurely. The birth was expected in February. On his website Prince Georg Friedrich announced the births with "great joy and gratitude". While Carl Friedrich is a rather uncommon name combination, Louis Ferdinand is a well-known name in Germany. Prince Georg Friedrich's father (1944-1977) and grandfather (1907-1994) were both known as Prince Louis Ferdinand and another Prince Louis Ferdinand of Prussia was a gifted musician and composer who died at the battle of Saalfeld fighting against Napoléon Bonaparte. Unlike recent moves in other European houses, Prince Georg Friedrich and his wife have opted for more traditional names. Princess Sophie gave birth in Bremen. The Imperial couple had left Berlin in December to return to Prince Georg Friedrich's own birthplace. He had also spent his youth in Bremen with his mother and younger sister and under the tutorship of his grandfather who nurtured him to become his successor after Prince Georg Friedrich's father died after an accident during a Bundeswehr manoeuvre, when his son was barely one year old. Prince Georg Friedrich and Princess Sophie married in August 2011. Their wedding in Potsdam was broadcast live in Germany and could even be viewed in Australia (by the Radical Royalist and friends). Thus win all men's applause! Special verse written for God Save the Queen in 1859 to celebrate the birth of the future Wilhelm II.